CMC Engineering Export GmbH representative Michael Perera come up with a great solution for the power crisis in 2018 and future of Sri Lanka power generations. Michael Perera stated that power crisis in 2018 would be a short of 500 MW and the current alternative of Coal power cost would be USD 3.5 -4 million per MW And will take 5 years or more to build it. And Michael Perera suggested that Solar is cheaper, but it may needs 4-5 acres per MW 200 MW requires 3.25 KM2. 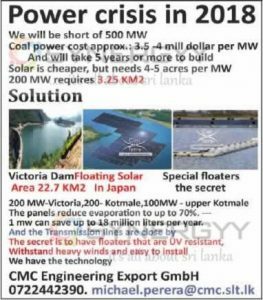 Therefore Michael Perera suggested a new project of Victoria Dam Floating Solar Area 22.7 KM2 with the Japanese technology. And this would sufficient for government to use200 MW from Victoria Dam ,200 MW from Kotmale Dam and 100MW from upper Kotmale Dam. The panels reduce evaporation to up to 70%.